Can anyone help me figure out what breed my rescue dog is? 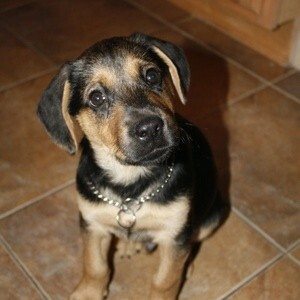 Maybe a Rottie mix. Whatever mix the dog is it sure does have pretty markings. Looks to me like maybe beagle and german shepherd. Is this pet full grown or a pup? If not full grown, then I would rule out beagle and say some other breed. What breed? Well, I cant help you there but this baby sure is a cutie. Looks part german shepherd and beagle to me. You can take your pet to a veterinarian and they can do dna testing to find out all the breeds in your dog or pet.